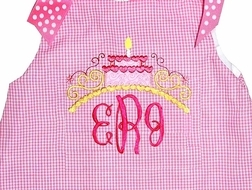 We just love this new birthday cake monogram topper birthday dress/outfit for your little one! We make the dress with hot pink gingham and embellish it at the bottom with two ruffles; the top ruffle is made of white eyelet and the bottom is hot pink gingham. 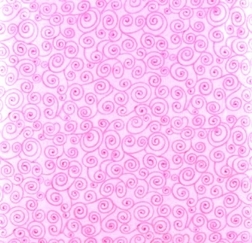 The cake is appliqued using a pretty light pink with hot pink swirls fabric and is trimmed with hot pink frosting. 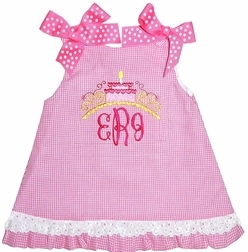 The bottom of the topper is made with metalic gold thread and "tops" your little girl's monogram in hot pink Fancy Script. The shoulders are finished with hot pink with white dots ribbon bows. If you choose shorts, capris or pants, they are made with the same fabric but only have the one hot pink gingham ruffle.